The excitement of teaching your kids to ski or snowboard is quickly damped with the big ticket price tags for buying your kids new skis or a snowboard. While you are eager to get your son or daughter out on the slopes, skiing or riding, the cost of buying brand new ski equipment for your kids can be price prohibitive at $250- 500. The reality is kids grow every year, another reality is they don’t love hand me downs, but there are alternatives for the alpine enthusiastic family. Beg, borrow, lease, trade or buy skis for your kids and hope your kids get more than one ski season out their ski or snowboard equipment. The decision to rent or buy brand ski equipment for your kids depends upon how often you plan to ski, what age and growth spurt your child is at, whether there are siblings that will be able to use the ski equipment in a hand me down fashion next ski season, and whether the best gear is from a rental fleet, a ski shop trade in program or a purchase on a great deal of kids ski package. If it’s your child’s first time on skis or snowboard, and you are planning a ski resort vacation, your best bet is probably to rent from the ski resort ski shop. You child will be professionally fitted with ski or snowboard boots, a well fitting ski boot is key to a happy day on the slopes. Many a skier has said “if your feet aren’t happy, you aren’t going to be happy on the slopes.” The bindings on their skis will be inspected and fitted properly to their boot by the ski shop technicians to prevent injury and allows for safe release. Ski poles and helmets are available from the rental shop too if that is something you need for your little skier. Visit the rental shop the evening before your child’s first ski day to get ahead of the morning rush, and to give your child more time to adjust to their new ski equipment. Your kids might even enjoy wearing their new ski boots around the condo and taking ownership of their skis a day ahead in anticipation. At the end of your family ski week, you return the rental ski equipment to the shop. 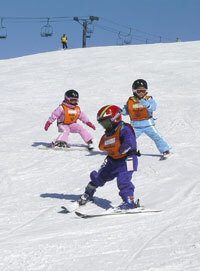 Note, ski gear is often included in the price of first time ski lessons or all day kids ski camp – be sure to ask. The advantage of renting is you don’t have to lug the ski gear home and store it till your next family ski trip – and hope it will still fit. If your child’s first ski rental experience goes well, and you envision skiing more as a family, then its time to take the next step and look at purchasing kids ski equipment. 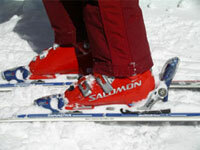 You need to amortize the cost of equipment over the amount you will use your skis, boots, poles, etc. If you have friends with kids that ski or snowboard, don’t be afraid to ask if they have equipment. So many families have outgrown ski equipment in their garages and basements. Better to start a family exchange program than to find that your neighbor has a fleet of ski boots and skis that no longer fit their kids’ feet. You will be able to reciprocate in the future with “hand me down skis”, snowblow the neighbors driveway, or reimburse them in kind for the kids ski gear. Ski Clubs and Rec departments host ski swaps and used ski gear sales in the fall. This is a great opportunity to buy used ski equipment from locals, especially ski team kids who have the latest greatest ski equipment. Some of these young ski racers and snowboard riders are sponsored buy ski manufacturers so they get new gear every year for free – so they are happy to sell last year’s ski equipment for much less than retail. The drawback, there is no exchange or refund, so ask questions of someone knowledgeable at the ski sale. At these ski swaps and ski sales, you can also buy ski clothing, ski pants, gloves or mittens, new or used helmets and goggles, ski socks, you name it! You can outfit an entire family in ski great for less than one pair of brand new ski at $500 at a ski shop. Budget for professional fitting, you should bring the equipment to a ski shop for ski binding adjustment and safety check if that service is not offered at the ski tent sale or ski swap. Ski boots should fit a child’s foot well. It is not a good idea to have a lot of wiggle room to grow into, nor should a kid’s ski boot be too tight. Performance is best from a snug fit ski boot. Skis should be mid face height, and in good condition, no rust or gauges on the edges and minimum scratches to the base of the ski. Cosmetic damage to the top sheet of the ski are not as concerning, although kids do like pretty skis with cool graphics, not big scratches which may indicate the ski or snowboard has had a lot of use. There are a few guidelines to finding the right size ski boots, skis, or snowboard for your child. Kids skis and bindings should last a few seasons. As for how to choose the right length ski for your kids, mid-face height on skis is a good measurement and allows for quite a bit of growth, and kids’ binding settings adjust from 50-90 pounds, which is a big window. But kids do move through boots sizes, often growing a full size in a season. Find a ski shop with a good reputation and honestly describe how often you plan to ski and how well your child skis or snowboards. Most ski shops offer a fleet of kids ski equipment in a price range from inexpensive ski packages with skis, boots, poles and bindings starting at about $200 – an entry level ski package that should last for a season, maybe two. More advanced and expert skis and boots for kids is available at the $500+ range, if your child is really proficient, carving turns, skiing moguls and black diamond trials, demanding more from their skis, boots and bindings. Expert kids skis and snowboards and boots are more performance oriented. Trade In Kids Ski Equipment at season’s end where your children’s ski equipment is credited, usually at 50% of the purchase price, toward the purchase of next year’s ski gear. Ski Trade In programs for kids equipment are great for growing kids, you can even swap out boots mid season if your child’s feet grow significantly. Lease or Ski Trade Plans work well for the ski shop too as they gain your loyalty for years to come, and you buy other ski stuff when you are in the shop – goggles, helmets, hand warmers, ski clothing for the kids and mom and dad. Visit ski shops pre-season to get the best selection and service, versus shopping for skis on Christmas Eve or the day before kids winter break. Ski shop technicians can size to the future in the fall, which parents appreciate, while looking out for comfort for the child. If a boot is too small or too big, the kids won’t be comfortable and it can be dangerous and certainly affect their enjoyment and their performance. Buying from a ski shop, you get this personalized service and a ski warranty or guarantee of some kind, an advantage over the ski swap or buying skis on EBay or Craig’s list. Buying ski equipment or snowboards from eBay and Craig’s list can save you money, but you need to know your exact ski boot size and read reviews on kids skis you are purchasing as there is no return or refund. Also watch out for eBay shipping fees on skis. You can spend another $50-100 on shipping the skis or snowboard that seemed like such a great deal. 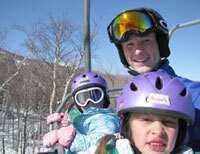 Ski Lease Programs and Snowboard Leasing for the season for kids. Ski shops will offer a junior lease for kids ski and snowboard equipment . You can lease a brand new package (boots, ski, bindings and poles) for between $150-$200, and if during the season your child grows out of the ski or boot during the ski season, the ski shop will allow to exchange. At the end of the season, you simply return the equipment, and get back your deposit in some cases, though most ski shops just keep your credit card on file for the leased ski equipment for the season. Leased ski and snowboard gear often becomes used ski equipment available for sail at the ski shop, or they will sell in their fall ski tent sale or ski swap. Assess how committed your family is to skiing, how often you plan to use your child’s ski or snowboard equipment, and how quickly your child is progressing, before making the rent, lease or purchase ski decision. If you are organized (or just overzealous like our family foursome) – you try on the kids’ gear for a fitting when the first red leaf appears. If you are the procrastinating type, you wait for a frosty Friday night in December to pack for your first ski weekend, then proceed to full panic mode upon discovering last season’s stuff is too tight.